VOL. II. THURSDAY, 20rH \ E, 1)57. No. 27.
ture of Confection.-ry) Order. 1957. grounds prescribed in Section 10 of The following Bill which is to be 2. The manufacture of confec- the Patents Act, 1906, fcr opposition introduced into the Legislative Coun- tionery is hereby d-clar.d to be a to the rant of Letters Patent. cil of Montserrat is circulated with pioneer in ustry for the purposes this Gazette and forms partthereof:- of the Aid to Pioneer Inidustries Dated the 28th day of May, 1957. Ordinance, 1957." hereby declared to be pioneer products Registrar. No. 69. for the said purposeRs. Orders are circulated with this this day of 1957. St. John's, Antigna. Gazette and form part thereof:- Clerk oJ the Council. Legislative Council of Montserrat of the list of the original assessments 27th May, 1957. 1 pp. Price 3 cents Board of Health has this day been New York, State of New York. U.S.A.
No. 12 of 1957, Proclamation Treasury by 31st August, 1957. District. 2 pp. Price 4 cents Secretary, Central Board of Health. make the undermentioned Order April, 1955 and issued on the 5th (lay the near future. 130 THE ANTIGUA, MONTSERRAT AND VIRGIN ISLANDS GAZETTE. [June 20, 1957.
weights and measures, and weighing Washing Soda the payment of an additional preinstruments at the following times mium. from 10.00 a.m. to 4.00 p.mn. on Wed- Administrator's Ofioe, appropriate premium in such cases. day 24th, Tuesday 25th, Wednesday Motor Vehicles. during the normal office hours. scril.ed above be a Bank Holiday, 2, The contract of insurance 15th of July, 1957. Ref. No. A. 82/1. 3. A list of the motor vehicles 14th June. 1957. Tenders are invited for the supply supplied to insurance agents on re- Ref. A. 66/13 -II of the undermentioned items to quest. for the period ending 31st December, 4. Tenders should be in sealed TRAFFIC NOTICE. to the Administrator of Antigua in addrssed to the Administrator to Attention is drawn to Rule 19(18. Meal Insurance of Goverament vehicles shall stand abreast." Butter (5 lb. and 1 lb. tins) fvieis. Milk-tinned sive insurance coverage, i.e. Fire, prosecuted. Fruqits-tinued and Barbuda. Traffic Commissioner. smoked and cured 2. In view of the large number of 3rd June, 1957. Islands, Grenada, and should reach or 5% of the assessed value of the Appointment: him not later than the 31st July, 1957. quarters, which ever is less. officer will be a mem)be(r of the staff ably qualified candidates for appoint- appofficer. In th free returse of a contractssages will of the Executive Architect. Windward ment to the post of Director of e appointment free satisfactory com-ur passages will Islands. and will be stationed in Works, Dominica, particulars of bletion of the on the satisfactory cornSt. Lucia. which are as follows: etion of the contract. Qualifications: Appointment: Leave & Leave Passages. a period of 3 years in the first to be taken on the satisfactory comThe Salary will be at the rate of stance. pletion of the period of engagement. _750) per annum, plus a pay ,addition Leave Passage Regulations. Quarters are not provided. Allowances: taxation imposed by local enactments. ances ar, payable in accordance with and Financial and Store Rules and Free passages to St. Lucia will be local regunlations in respect of ap- subsidiary legislation in force for the provided for the officer his wife and proved travel on duty. time being. be provided on the satisfactory termi- Works )-partment and for the plan- to the Chief Secretary, Windward nation of the period of engagement. ning :and execution of Public Works Islands, Grenada and should reach development schemes as well as the himn nou later than the 31st July, Leave: general supervision of all aspects of 1957.
the d( apartment's work. By virtue Ref.No.A.C. 13/89-III Vacation leave on full salary will of his office the officer is a member be granted at the rate of one week of various Boirds and Committees. for each completed p e r i o d of He will also be required to perfoim RAINFAILL FIGURES. leave to be taken on the satisfactory to time be assigned to him by the Antigua. termination of the officer's con tract. Administrator. Month 153. 1954. 1955. 1956. 1957.
axation imposed by local leg-'slation. ability. Printed at the Government Printing Office, Antigua. Leeward Islands, by E. M. BLACKMAN, Government Printer.-By Authority. No. of 1957. Stamp Act (Amendment). MONTSERRAT. F An Ordiance to amuend further tile Stamnp Act. 1. This Ordinance may be citedi as the short, tite. Starnp Act (Amnendment) ()rdiniknco, 1957, and CP 3.
lItnewal of' passport .. 4.U. Proclamnatioii puiblishedI in the 6Gazettle. MONT- 2 Stamp Act (Amendment). No. of 1957.
by E. M. BLACKMAN, Goverinm.nt Printer.-By Authority. CUSTOMS DUTIES ORDINANCE, 1928 (No. 711928). 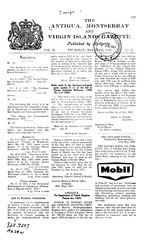 NOW THEREFORE, BE IT RESOLVED) that the Customs duty leviable on the merchandise, namely, wireless apparatus for use in communication between the aircraft of the Leeward Islands Air Transport Services Limited and a station ashore in the Colony imported by the said Company into the Colony in the month of November one thousand nine hundred and fifty-six be remitted. Passed the Legislative Councoil this 28th day of May, 1957. Printed at the Govertnent Printing Office, Antigua, Leeward Islands, by E. M. BLACK lAN M RE., Government Printer.---By Authority. CUSTOMS i)UTIEs ORDINANCE, 1928, (No. 7/1928). ,o goods shall be abolished. Fuel for internal combustion engines. GEORGE CABEY, (irA of the council. 5200001-500-6 57, Price 4 oew is. STAT ~ ju IT()Y U S\ N I) oRDE I s.
I)ROCLAMA~TION 1) TI)] JUNE 14t, 19,57, -DECLARING THEF WINDAl) Dis-mie'v TO BE A, lituR',T D)ISTRICTr. BY TI' AOFJ\ Sf ATO W MONTSI2RATr. NOW. THEREFOREtl] in pursuance of the powers vested in the Governor in GTCm by h the saidl Ordinance and of all other powers thereunto eliablino' I. 1 AwRUR FRANCIS DAWvKINS, 11sqire. Ad ministrator of thn- ('ol nY of' Montserrat, by and with the advice of' the Executive C'ouniil of the said Colony, (1o hereby declare that portion of the Colony described in the Sceil eeot eaL-d district to be called the INWindw'nrd Rural D~istrict and the, boundaries set forth in the said Schedule are hereby specified to he,, the boundaries of the said rural V district. All that portion of the Colony of Montserrat bounded on the North by an iniginarN' line from Trants Bay to the northern end o--f Windy 1-1il1 ridge; on the South by Gut Miaframey along its entire length to the Sea; on the East iw the Sea and on the W~est by an iiag-inary line runningr from the origin of G ut Maframney to Farrell's Mouintain and continuDig to the northern end of Windy Hill ridge and to include Windy Hill. by E. ATL.i A CKIMA N Governrnut Printiur-fy A uthori ty. 2. Extension of' &et to Pederation of' Nigeria, The~ Reciprociil Eniforemrent of I udgimen ts Act (Car). the FederiaWon of NIiaeria set out MU the S schedule hereto. prid Protectorate of Niger ia is liereby rev'oked. The Federal Supreme Couirt of Nigeria. The High Court of the Western Region of Nigeria. The Highi Court of the Northern Region of Nigeria. The High Couirt of the Enisterrn Regi of Nigeria. The High Court of tile Southern Carneroons. The High Court of Lagos. Made by the Governor iin Counicil this 18th day of A pril, 1957. Acting Clerk ot the C'0ocil. Printed at the Government 1' rinting, Olee. AntiLitmt. Leeward Islands. by E. 'NI BLACKMAN, Governrnfwnt Printer, By .\tibority, 1957.